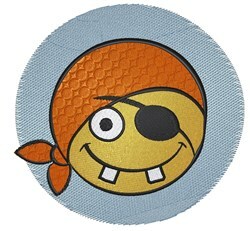 Ahoy Mateys, join the crew while you hoist the sails with this design on throw pillows, clothing, totes and more! King Graphics is happy to present Pirate Emoticon machine embroidery design which has 20964 stitches and is [121.92 mm x 118.62 mm] large. If you would like to view more embroidery patterns please search on our embroidery designs page.